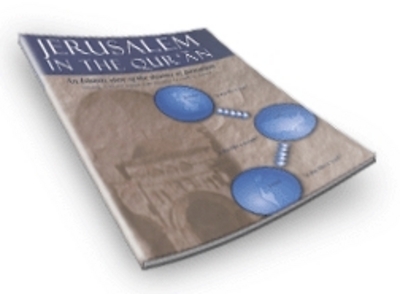 Apologies for only learning of Jerusalem in the Qur'an by Imran N. Hosein, 2d ed. abridged (Long Island, New York: Masjid Dar-Al-Qur'an, 2003) nearly a decade after its publication, but it nonetheless bears notice, for two main reasons. The Qur'an referred to Jerusalem, time and again, as a "city" or "town" – but without naming it ... This appears to have been part of the divine cloud that shrouded the subject of the role of Jerusalem in the Last Age. I leave it to Hosein to interpret divine clouds shrouding subjects; I stick to earthly texts. Jerusalem in the Qur'an was written partly in response to the newspaper article of Daniel Pipes that was published in the Los Angeles Times ("Jerusalem means more to Jews than to Muslims," July 21, 2000). In it he attempted to dismiss any Islamic claim to Jerusalem by declaring of Jerusalem, among other things, that: "It is not once mentioned in the Qur'an or in the liturgy…" Dr. Pipes and his media surrogates, who provoked us to respond, may wish to revise their opinion if they were ever to read this book. … Regardless of whether Dr. Pipes accepts or does not accept Jerusalem in the Qur'an, it is clear that the study of this subject matter is basic for an understanding of the problem of Israel and Islam. Well, I read Hosein's antisemitic screed and, sorry to say, am not convinced by his laborious argument that Jerusalem really is in the Koran despite its never being named there. I admit to special puzzlement when the good author asserts that Deuteronomy 9:6 is a forgery and that the long Muslim rule of Jerusalem offers "a clear Sign from the heavens of Divine approval of Muslim rule over the Holy Land!" How might these prove that Jerusalem really and truly is in the Koran? Hosain also wanders off to discuss such irrelevancies as a pharaoh's death, the Anti-Christ, the Khazars, the Soncino press, the Ahmadiyya, the outbreak of World War I, the Bretton Wood financial system, Israeli justice, and the feminist revolution. Also, Henry Ford, Fidel Castro, Hal Lindsey, and Louis Farrakhan all waddle into his account.